The Somali is often touted as the “longhaired Abyssinian” because the two breeds look very similar – except for the length of the coat. Both breeds sport what looks like dark eyeliner and tufts of white fur under their chins. The Somali wows people with its bushy, squirrel-like tail and fox-like coloring and ears. All Somalis display an “M” tabby mark on their foreheads. Its medium build lends itself to a posture that appears as if the cat is stretching up on his toes when standing. Despite its long coat, the Somali’s groom needs are minimal. Weekly brushing keeps its coat healthy and mat free. It does not shed very much. Females weigh between 6 and 9 pounds and males average between 10 and 12 pounds. Fans of this breed embrace the Somali’s fun nature, energy bursts and humorous antics. This cat is quite capable of turning out faucets with its paws, opening cabinet doors and dashing into hiding spots. Harness its smarts and energy effectively through positive training and you will reap one devoted, “dog-like” cat. This breed can be strong-willed at times and does not respond well to punitive measures. Anything but shy, the Somali will invite you to play chase and enjoys fetching toys. This breed welcomes the company of kids and other family pets as well as houseguests. Despite its extrovert personality, the Somali is not much of a talker and is fond of “making biscuits” (kneading) on laps. The Somali is prone to gingivitis and other dental conditions, so start getting into the daily habit of brushing its teeth to keep the gums healthy. Strangely, this breed has a hair fetish and loves to paw your hair, beards and moustaches. Pinpointing when this breed got its start remains clouded in controversy. Cat experts speculate that the Somali breed was derived from the mating of Abyssinians with non-Abyssinian longhaired cats shortly after World War II. At the time, the population of known Abys had dropped to around a dozen. 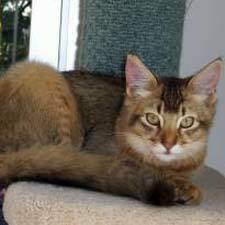 In the United States, some cat breeders purposely bred this beautiful, “longhaired Abyssinian mistake” and rallied for its acceptable by cat breed registries. Today, the Somali is ranked 21st in popularity among the breeds listed by the Cat Fanciers Association and earned championship status by the CFA in 1979. Other major cat associations have also accepted it.